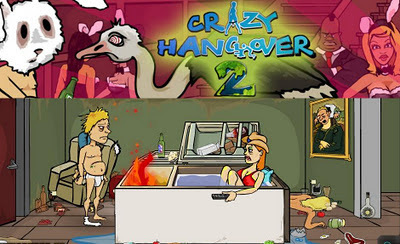 Crazy Hangover 2 is a new humorous point and click sequel to one of the most funniest games from gamesfreeca. Your objective in this game is very simple and that is to find your costume so you can go to work. Sounds easy but what gets in your way is just ridiculously challenging and crazy. The game starts off with you waking up hanging from the ceiling inside a messed up room with a leashed alligator. You start to wonder what happened last night and started checking out other rooms to find clues only to be greeted with crazier scenarios. Meanwhile, here is Crazy Hangover 2 walkthrough if you can't solve the game due to excessive laughing.